Fine ELEC belongs to the 4M BIM Suite of software for Architecture & Engineering. Based on an AutoCAD-like environement it uses also DWG as its native file format for an unrivaled compatibility with AutoCAD. The 4M BIM Software are renown by BIM experts to be the BIM software offering the most intuitive transition for AutoCAD users. Their price is also up to 4 times lower than the one of their main competitor. In Fine ELEC you just need to master some very simple 2D commands any CAD user knows like drawing polylines, trim or extend and the software will build the 2D and 3D project out of these very simple steps. Fine ELEC combines an AutoCAD-like look and feel and an advanced BIM technology that will help you to draw your project and networks. If you do not feel like drawing a 3D BIM model you can use a DWG drawing in the background or just draw it yourself using Fine ELEC's CAD features. Drawing the building in 3D with BIM objects is not required to calculate the cables, protection devices, short circuit controls, permissible current in each line, voltage drops and more but Fine ELEC will help you to do it in just a few clicks. Calculation and design are independent modules : you can use only one for some projects if, for example, you like to enter just the data in a table to calculate the network. To draw the building you just need to focus on floor plans using the intelligent and parametric objects of the AutoBLD menu and Fine ELEC will build the 3D for you. A simple double-click on any object will display its properties for modification. You have all the required tools to create or modify the BIM model without using any other software. Unlike other BIM MEP Software, Fine ELEC uses DWG as its native file format and includes features to convert into vectors all the sophisticated objects you will use in the BIM project. Once converted into simple vectors our objects will be visible in AutoCAD® as CAD entities users can modify. Sharing 2D or 3D files with other professionals is therefore much easier. 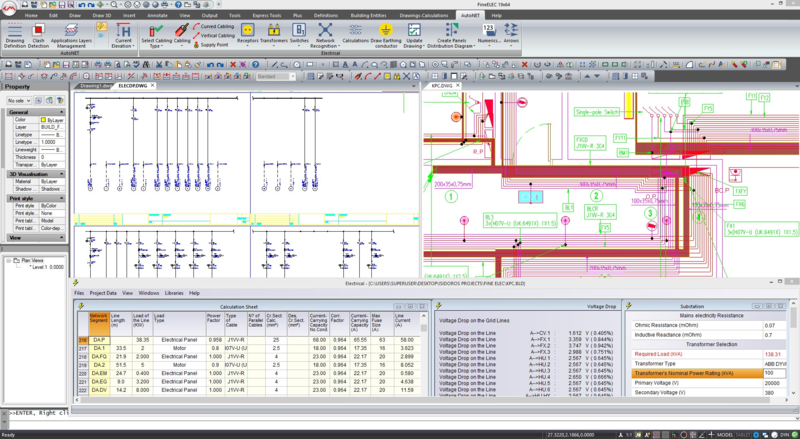 This MEP Software includes all the features of 4MCAD , our alternative to AutoCAD®. 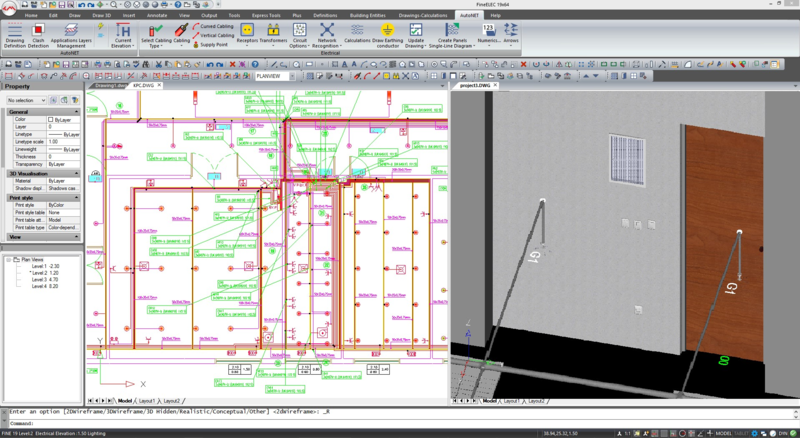 You get 2 software in one, your can keep using CAD to edit some DWG drawings. Unlike in other BIM software, Fine ELEC's advanced and very intuitive BIM technology does not come at the expense of speed, it is just the opposite : you just need to draw a few single lines and the software will do the rest. Fine ELEC includes extensive libraries of receptors and electrical devices: panels, receptors, appliances, lights, switches... Some of them like lights can be automatically placed in the rooms. These libraries can also be extended by the user who can change the symbols and add more components. Cables can be drawn with simple commands (just polylines) but you can also take advantage of some expert routing commands like "Cables Parallel to Wall, automatically connected to the receptors" to speed up the process. After performing the calculations you can update the drawing from the calculation and insert in the floor plans the information resulting from the results. Fine ELEC will also help you to create automatically the legend table showing the signification of the symbols used in the drawing and of course to generate all the technical drawings like the system diagrams and panel drawings. Fine ELEC's Calculation module is closely interacting with the installation drawing. Calculations are performed following the norms HD 384, IEC 60364, BS 7671 and VDE. Fine ELEC's Calculation module will read the drawing and display into tables all the details required to proceed to the calculations. You can of course modify these data if you want for example to anticipate a future extension of the network. You can calculate the cables and protection devices taking into account any relative parameter (ambient temperature, cable installation method and means etc.). Intermediate calculation results (e.g. permissible current in each line, voltage drops etc) are also presented. Optimization routines (such as automatic phases allocation) and control procedures (such as short circuit controls etc) are also accomplished. In addition the program produces the bill of materials, and a series of technical descriptions. All the results are shown in the calculations output and are completely documented. Results are sent back to the drawing and exported in a calculation report you can customize. After proceeding to the design of the network and calculations our Electrical Software will let you generate all the technical drawings and reports you need. Our Electrical Software will generate for you the technical drawings of the project in DWG drawings you can further modify and/or share. Fine ELEC will generate a document with the calculation results and the bill of materials describing the quantities of each of the components and cables required to build the Electrical installation. The template of this document can be customized and you can chose which results you want to display. Founded in 1986, 4M has a long experience of BIM with a full suite of BIM Software for Architecture & MEP which first version wa slaunched in 1993. The 4M BIM Software are renown by experts to be the BIM software offering the easiest and quickest switch for AutoCAD users as they are the only ones to use DWG as their native file format and an AutoCAD-like look-and-feel. FineELEC's sophisticated BIM technology will boost your productivity. The software "understands" you and with the help of our smart modelers and libraries of ready-t-use components or BIM objects you will be able to draw the building much faster and easier. Our Electrical software includes a Calculation module and a Design module that will closely collaborate together. Fine ELEC will simply read the BIM model to understand the installation and proceed to calculations before finally updating the electrical installation with the calculation results. Last but not least you will be able to collaborate with other BIM software and share your electrical installation with other architects and engineers working one the same project. The BIM information can also be extracted from the project to instantly calculate the cost and create a Bill of Materials.